Test existing Gas supply pipe work and confirm soundness. Installation of new 10” headers, 5 new 65mm F&R circuits including valve set up and pumps, 2 no 80mm F&R branches to each new boiler and Dirt separator to header. Drain down each of the existing circuits and weld in new 65mm tee’s and 2no Valves to each circuit. Installation of new pressurization unit. Open & test each circuit one by one and test. Drain down & disconnect existing boiler (LHS) 2 no hot water boilers and existing calorifiers. Strip out existing headers and pipe work to existing calorifiers. Connect new boiler 1 to new headers. Connect pipe work to new calorifiers 3 & 4. Open valves on new boiler and calorifiers and confirm operation. 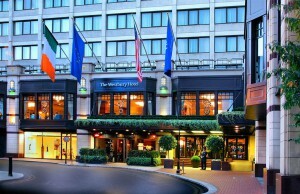 Extensive works installing & commissioning the new boiler room at one of Dublin’s landmark hotels. Installation of a new pressurization system.